A Wi-Fi dongle is extra and the extra brightness means a loud operation, too, but the PJD6544w remains a smart choice for anyone after a projector that takes a thoroughly modern approach to presenting. This is a thoroughly advanced and well connected business beamer. Although slated to be portable and travel-friendly, ViewSonic's well-connected PJD6544w is - at 2.14kg and measuring 335x265x128mm - bulkier than its rivals. It does, however, have a very good excuse. With an LED-powered light source for a DLP engine that measures an eye-searing 3500 Lumens, the PJD6544w is comfortably the brightest so-called portable we've yet seen. And with free apps that enable wireless integration with iOS devices - the PJD6544w is great value all-rounder with some unusual, but very welcome characteristics. With a WXGA resolution of 1280x800, the PJD6544w's six-segment DLP colour wheel just about manages HD-quality images, though in the 16:10 aspect ratio. The ins and outs mark out the PJD6544w as a data specialist: as well as two single 3.5mm jack audio ins and an out, there's S-video, composite video, a couple of RGB D-sub 15-pin inputs, an RS-232 (for integration into control systems from Crestron et al), one HDMI input and three USB slots (regular 2.0 spec for thumbdrives, mini USB, and a Type B USB for software updates). There's also a wired LAN port (through which four laptops can be connected), though Wi-Fi is via an optional add-on dongle only (ViewSonic's WPD-100). Shame. Using a screw-down leg to adjust the height and the PJD6544w's 1.2x manual zoom, we achieved a lovely 65-inch image from 1.4m, which is about as large as the image gets before the pixels become obvious. In our review we used a professional reflective projector screen, but the PJD6544w does have a few options that recognise how projectors like this are used. As well as a regular colour picture modes such as Brightest, PC and Movie, the PJD6544w provides ViewMatch, GreenBoard and WhiteBoard. A couple of user defined gaps are left for tweakers. The user interface on the PJD6544w is plain to say the least. It looks traditional in every sense, with PC-like drop-down menus for everything from Picture (which includes a 3D setting as well as colour temperature and RGB gain settings) and Video/Audio to Settings and Options. The latter includes a link to define what the MyButton on the (rather stubby, small) remote control does. There's a choice of everything from colour settings and projection style to 3D settings and sleep timer. The BrilliantColor tech on the PJD6544w works a treat, though it's that sheer brightness that we love best of all.We managed to review the PJD6544w in the middle of the day, windows flung open, without much loss of image quality. That's rare for any projector of this size and price. Through the HDMI slot we played Bad Teacher from LoveFilm via an Xbox 360, and were impressed by the subtlety of the image on Movie mode, though there's not much shadow detail. Animated fare looks the best, perhaps, but colours have more punch than on rival models. However, the ViewMatch colour mode is a tad noisy and the Brightest mode can produce a lot of rainbow effect. Still, in daylight it works a treat. From a USB thumb drive the PJD6544w made at decent stab at our myriad collection of files and formats. Within its EZ Media suite, an Office Viewer mode supported supported all the major file formats including Word, Excel, PowerPoint and PDF (though oddly not from a USB thumbdrive from a Macbook), while the media player software is almost as comprehensive. Sadly there is no reliable support for MKV files, but many other video codecs are coped with, including AVI, MP4, WMV/HD, AVC HD, MOV and even RM Real Player Media files, all played without a hiccup. Music covers FLAC, APE, WMA, WAV, AAC and MP3. Although the PJD6544w can produce its own Wi-Fi zone for the mirroring of laptops, no Wi-Fi dongle was supplied with our review sample. However, there is an app for iOS devices that's devilishly simple, and yet more advanced than rivals. With the ViewSonic vPresenter app launched and the PJD6544w on our Wi-Fi home network, a passcode was exchanged to establish the link and wake EZ View on the big screen. The likely files - PDF, Word, Excel, PowerPoint, Pages, Numbers and Keynote files - can all be played from an iPhone or iPad, and photos, too, though it's crucial to orient the iOS device correctly. It gets better: as well as being able to draw on photos - something we've seen from a very (very) similar-looking app on BenQ projectors - vPresenter goes a step further by enabling similar functionality from a built-in web browser. It can also display live video from the device's camera on the big screen - brilliant for medical or engineering lectures, perhaps - and even fetch any file from a linked Dropbox account. The brightness, the vPresenter app, the myriad connectivity options… there's a lot to love about the PJD6544w. Peak whites are strong even in daylight - a rare characteristic at this size and price - while movies in a blackout are very watchable. 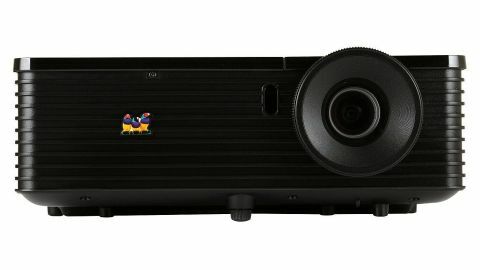 Even the mono speaker - an impressive 16W in power, which is unique on a business projector - impresses in volume and detail. Some of the picture presets, while welcome, are a little rough and ready. Another slight drawback of the powerful light engine is loudness; we clocked 62 decibels in normal operation, peaking at 70 decibels. It funnels out hot air from the right-hand side, too, so don't sit too close. There's also a longevity issue; the PJD6544w lasts 'only' 5000 hours, while most LED-powered beamers go for around 30,000 hours (extra lamps cost £250). While the Live Camera feature on vPresenter is great, it does stutter rather too much for close, detailed work; it's no substitute for a proper set-up in, say, a lecture theatre. A thoroughly advanced and well connected business beamer, the PJD6544w is much brighter than most, and though that means extra bulk, for many it will be worth it since it can deliver a presentation in almost any lighting conditions. An excellent vPresenter app that shows all manner of files stored on an iPhone or iPad - or even on a linked Dropbox account - reaches its zenith with real-time streaming from an iDevice's camera. A Wi-Fi dongle is extra and the extra brightness means a loud operation, too, but the PJD6544w remains a smart choice for anyone after a projector that takes a thoroughly modern approach to presenting.